The folks at PolitiFact must be awfully busy. So busy that they rush their work and have too little time to run correction notices. A PolitiFact video explaining President Bill Clinton's role in signing NAFTA informs viewers that President George H. W. Bush negotiated the treaty. And shows an image of Jeb Bush and President George W. Bush together, waving. James Skoog appears to have noticed it first. 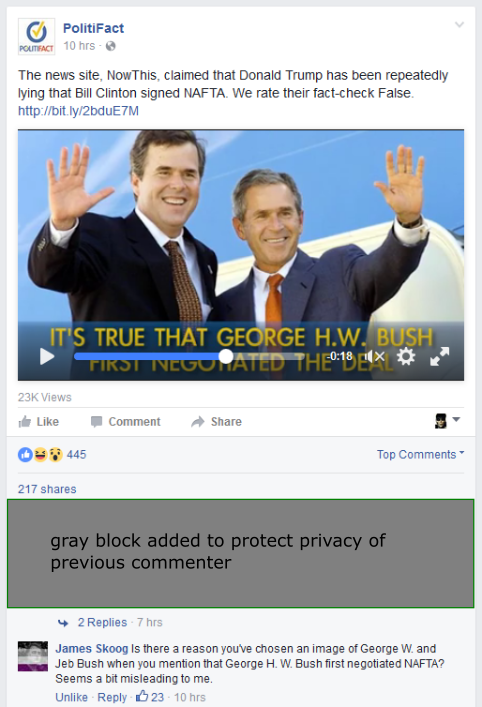 Maybe PolitiFact found a picture of George W. and Jeb waving at George H. W. as the latter negotiated NAFTA?